Elisabeth C. Miller Library: Gardening Answers Search Results for "2146"
I was reading an article in the local paper that mentioned Magnolia grandiflora 'Alta' and was hoping that you could tell me more about and its hardiness in the Pacific Northwest and what its mature dimensions would be. Magnolia grandiflora 'Alta' is a trademarked Monrovia introduction. According to their website, it is "very slow growing to 20 ft. tall, 9 ft. wide in 10 years." Since this is a relatively recent introduction, there is not going to be much information about its hardiness in our area until more gardeners have grown it and shared their experiences. The longevity of the species Magnolia grandiflora and its cultivars can only be estimated (between 50-150 years, according to SelecTree.) Trees grown in urban settings are often affected by root disturbance, pollution, and the like, so their lives may be somewhat toward the short end of the expectancy range. "Provide southern magnolias with good drainage and full to partial sun. They thrive in hot spots, where the extra heat encourages better flowering. These flowering evergreens prefer well-drained, sandy soil, but they tolerate average garden soil. Best growth and flowering requires occasional summer watering, but once established, southern magnolias withstand considerable drought. Garden gently under magnolias, for they have fleshy roots that can easily be damaged. The best approach for companions plants is to tuck in natural spreaders and let them flourish untouched." From my observations, they do not do well in the occasional winters when we have heavy snowfall, as their evergreen leaf-laden branches are prone to breaking under the weight of snow. Otherwise, they seem to survive here. I have a very tall, well-established Magnolia grandiflora. The tree is located on the southeast corner of the lot. Every summer it has produced large white flowers, but last summer that there weren't as many blooms, almost none. It's left alone and watered spring through summer by a sprinkler system. I have also noticed yellowing of the leaves at the ends of the branches. Usually the leaves have been dark and green. I'm wondering if it is a lack of nitrogen or food of some sort. There are a number of reasons that plants may fail to flower, and it would be difficult to pinpoint precisely why the Magnolia made such a weak show this past summer. Sometimes, cold temperatures kill off flower buds (and there were some cold snaps last winter). The tree is not immature, and it sounds as if it is not pruned improperly, so those potential causes can be excluded. You also indicate that it is not fertilized, so it is probably not receiving excessive nitrogen which can lead to lots of leafy growth at the expense of flowers. I wonder if anything else in its environment has changed: has the amount of light changed (any new construction obstructing sun? ), or has anything happened to the soil where it is planted? You might wait and see if flowering returns to normal this year. Mineral deficiencies: Certain nutrients, in relatively small amounts, are required for healthy plant growth. Deficiencies can cause tip chlorosis or necrosis or cause foliage to discolor, fade, distort, or become spotted, sometimes in a characteristic pattern that can be recognized to identify the cause. Fewer leaves, flowers, and fruit may be produced, and these can develop later than normal and remain undersized. More severely deficient plants become stunted and exhibit dieback. Commercial laboratories can conduct foliage tests or soil analysis to verify deficiencies. Identification/Solutions: Nitrogen and iron are the only nutrients in which woody landscape plants are commonly deficient. Poor root growth caused by water-logged soil, root diseases, and nematodes can also cause iron deficiency symptoms. Fertilize only as needed and only if other problems have been eliminated as the cause of poor growth. Avoid overfertilization, especially with high-nitrogen fertilizers. Slow-release formulations of nitrogen or organic fertilizers reduce some risk of overfertilization. Correcting deficiencies of minerals is tricky. Apply only the mineral found to be deficient. In some cases, soil characteristics may exacerbate deficiencies. Alkaline soil (high pH) often makes iron or manganese less available; reducing alkalinity with sulfur or organic amendments (peat moss) may be all that is needed. Some minerals such as iron, manganese, and zinc are absorbed more rapidly as a foliar spray than a soil application. If the environmental causes don't ring true with your tree's situation, you may want to do a soil test to see if there are nutrients which need to be supplemented. I have a Magnolia grandiflora 'Little Gem' - I've noticed it is not flowering very much any more and when it does produce flower buds, they turn brown and start to die before they have fully bloomed. Can you tell me what causes this and what I can do to keep this from happening. The tree itself seems quite healthy and is growing very well. There are a number of reasons that plants may fail to flower, and it may be difficult to pinpoint precisely why for your Magnolia grandiflora. If this is a newly planted Magnolia, it may be too young to flower. Magnolias are somewhat notorious for being slow to flower. Sometimes, cold temperatures kill off flower buds. This could cause bud browning and failure to flower. Magnolias can be quite sensitive to cold temperatures and to wind, in particular (see the picture of another Magnolia species with frost damaged flowers here In some cases, frost damage can be severe enough that the flower buds die entirely. There is a chance that the M. grandiflora's failure to flower could be related to fertilizers, as well [source: This Old House website]. Making more phosphorus and micronutrients available to the tree, or avoiding adding nitrogen, can help balance this out. Rankin's book says that a Magnolia which is mulched once or twice a year does not need supplemental fertilizer, and adding it can encourage excessive vegetative growth at the expense of flowers. When there is a high quantity of nitrogen, plants tend to grow leaves rather than flowers. For example, flowering trees planted in lawns that are heavily fertilized with nitrogen may flower much less or not at all. Finally, M. grandiflora tends to need a fair amount of sun in order to blossom. On one gardening web page, I found an anecdote where the author talks about a M. grandiflora tree they own, half of which is shaded and flowerless, and the other half of which gets sun and flowers profusely. According to Magnolias: A Care Manual by Graham Rankin (Laurel Glen, 1999), any Magnolia planted in heavy shade will flower very weakly at best. I have two questions. When is a good time to prune Parrotia persica? What can I do about a canker on the trunk of a Southern Magnolia? According to the American Horticultural Society's Pruning and Training (edited by Christopher Brickell; DK Publishing, 1996), Parrotia persica should not need a great deal of pruning, but if you do prune, it should be from fall to early spring. If you are growing it as a shrub-like shape, you should not thin or shorten laterals, as this will cause congested growth. If you are growing it in a tree-like form, the trunk can be cleared to about 5 feet, allowing the crown to branch. If needed, you can shorten pendulous tips to give clearance for walking beneath the tree. Once established, this tree should not be pruned. If the tree was a grafted specimen, remove any suckers. This information from University of Florida discusses Southern magnolia (Magnolia grandiflora), and says that cankers may kill branches, but the affected branches may be pruned. "Canker diseases will kill branches. Cankers on branches can be pruned out. Keep trees healthy with regular fertilization and by watering in dry weather." Magnolias by Rosemary Barrett (Firefly Books, 2002) says that "various cankers, such as nectria canker, dieback and trunk decay can all be dealt with by cutting out the dead or diseased wood. Rarely will any of these diseases cause the death of the plant." We are looking into growing evergreen Magnolias as part of our nursery stock. Do you know what varieties will be the most cold hardy in the Pacific Northwest, and will be able to handle heavy snow the best? You may have already come across this garden forum discussion on this very topic on GardenWeb. "The slow growth and controlled size of 'Edith Bogue' make it a good choice for courtyard and patio plantings, and its branches have strong resistance to breaking in wet winter snows." Their site also claims the variety 'Victoria' is resistant to damage from heavy snow. "The leaves are smaller in all dimensions than those of M. grandiflora, better suited to dealing with the snow loads that can be the death of the larger species, even for those cultivars that are otherwise quite hardy." 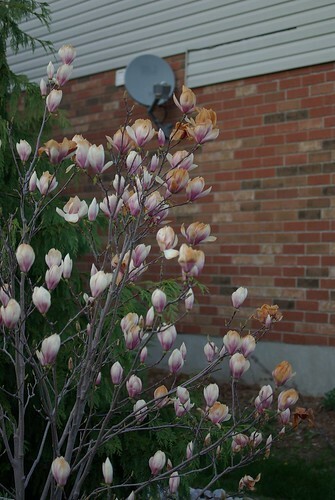 I looked at several of our books on Magnolias, but snow load doesn't appear to be a consideration for the authors--perhaps they've never walked around the Pacific Northwest after a snowstorm, and seen all the sorry-looking evergreen Magnolias bent and broken in the parking strip gardens! I suspect that even the snow-load damage-resistant varieties are susceptible to a degree. I've been observing the ones in my neighborhood. Those with a more upright, narrow structure seem to fare just a little bit better (gravity may make some of the snow fall off the foliage?) than the really wide-branching ones.